Colorado based duo Big Gigantic have been hyping up crowds and cranking out hits for nearly ten years now, and have become staples in the festival scene with their out of this world live show. They’re stopping in on Music City tonight, Feb. 18 to throw down their highly energetic dance-inducing beats at Marathon Music Works, and will be joined by LA based ambient electo pop producer Shallou. Nashville based DJ Hustle Up is also on the bill to keep the crowd hyped between sets. General admission tickets to the show are still available for $28, though the Tito’s Lounge VIP Experience tickets are already sold out. Head below to read more about the artists, and find out how to end your weekend with a bang. 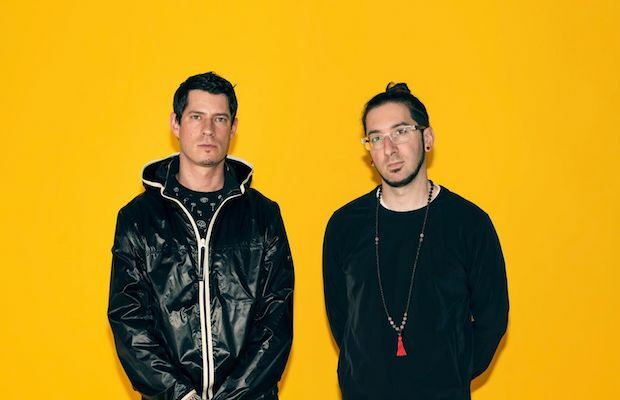 Big Gigantic began their musical journey with a pair of 2009 releases, Fire It Up and Wide Awake, but the band have found undeniable success over the past few years with the release of their latest, Brighter Future. This record leaned hip hop through collaborations with high powered rappers like Waka Flocka Flame and Logic, and also enlisted the help of guest vocalists like ROZES, Angela McCluskey, Natalie Cressman, and more. Of course, the core of the LP features the group’s trademark intricate high powered, dance-tastic, horn-laden backbone, which hovers between the EDM and Jamtronica genres. Big Gigantic have also teamed up with some heavy hitters including producer GRiZ and Nashville’s own breakout duo Cherub. The latter doesn’t have any dates on their tour schedule, leaving us wondering if they might even make a guest appearance. If you are a newb to Big Gigantic, it’s unlikely that you haven’t been exposed to their music. Just take one listen to their mega-hit collab with GriZ, “Good Times Roll,” which has found its way into numerous television placements, below. Big Gigantic’s intense live show includes dynamic lighting and production, and has made them standout late night acts at the country’s biggest summer festivals, which should translate into one hell of a party in a room the size of Marathon. Now LA based producer Shallou (aka Joe Boston) has incorporated years of experiences and travels into his ambient, soulful indie pop. Boston began his journey growing up in Washington, D.C., and credits his hip family for his love of musical discovery. He attended college in the musical melting pot of New Orleans, before heading to the EDM friendly space of Chicago to further refine his sound. By 2016, Shallou released a pair of highly acclaimed singles, including the summery vibes of standout, “Doubt,” which has racked over 25M plays on Spotify. Last year, with the release of the debut EP, All Becomes Okay, Shallou notched another certified hit with the single “Begin,” featuring vocalist Wales, and you can take a listen to that below to get a taste of how this ethereal electronica is going to be the perfect warmup for the heavy-hitting rollick of Big Gigantic. Big Gigantic and Shallou will perform tonight, Feb. 18 at Marathon Music Works. The show is all ages, begins at 8 p.m. (doors at 6:30 p.m.), and tickets are available to purchase for $28.